Did You Know… The City of Burlington is Cracking Down on Temporary Signage! The same signage regulations for the City of Burlington, NC have been in effect for more than 10 years but haven’t been strictly enforced… until NOW! Local officials report that tax service businesses have been the main offenders lately. Mayor Ronnie Wall calls the small advertising signs along walkways “eyesores”. Enforcement efforts made in the past and ones about to be made come Wednesday are all in response to community complaints. Check out the rest of the article from Times-News here. What IS a “Temporary Sign”? Zoning officials will remove any temporary signage (signs not attached to the building) that exceeds the 1-per-business limit or interrupts right-of-ways. Removal of obsolete and dilapidated signs will also take place. There are a few exceptions for certain businesses and organizations, such as public/non-profit groups and real estate companies, who are allowed temporary signage with certain restrictions. Visit www.burlingtonnc.gov to download and review Section 32.12: Sign Regulations. There is good news… This enforcement won’t interrupt your advertising efforts with help from PIP Triad! We offer plenty of signage options that are still in compliance with the City of Burlington’s Zoning Ordinance. Businesses are still allowed to display window meshes and decals, exterior wall murals, and building-mounted banners – and of course, these ordinances do not apply to a store or office’s interior. Wall murals can be applied to almost any surface, even brick! And of course your traditional vinyl banners always get the message out, just make sure they are secured to your business structure. Visit www.piptriadsigns.com or stop in to discuss your options! 1. Hide your activity, but make your profile public. This could get confusing, so let’s break it down. When you plan to look for a new job, one of the first things you should do is update your LinkedIn profile. However, you don’t want to alert your current bosses of all this activity, lest they get suspicious. Head to Privacy & Settings > Profile > Privacy Controls > Turn on/off your activity broadcasts. 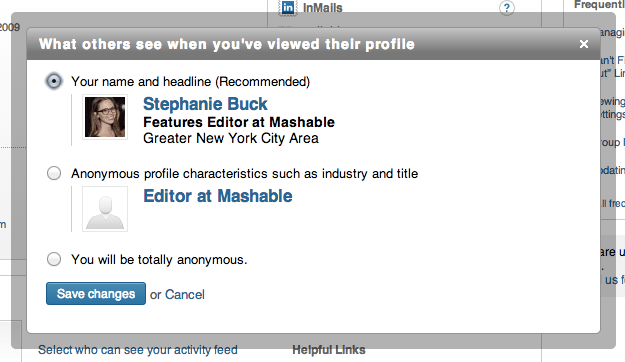 This will prevent edits to your profile from appearing in LinkedIn’s feed of updates, on your boss’ homepage. After unchecking that box, feel free to make updates, follow companies and apply to jobs via LinkedIn in peace. However, consider turning on your public profile so others can see when you’ve viewed their profiles. Katrina Wright, VP at Ferguson Partners, a global professional services firm specializing in executive search, says a public profile can alert the right people that you’re interested in their work. “If [you] are browsing profiles of HR managers at companies [you] are targeting to go work for, adjust the setting so those people can see that the prospect viewed their profiles,” she says. They’ll know you’re interested in learning about the people behind the companies, instead of just following the brand alone. 2. Maintain a transparent public profile. In addition to updating all the information on your LinkedIn profile, make sure you remain as open as possible about your professional past. According to LinkedIn Career Expert Nicole Williams, the most common mistake job seekers make on LinkedIn is not accounting for gaps in their employment histories. We’ve all had jobs that don’t align with our ultimate career goals, times when we’ve chosen to go back to school or even months we needed a sabbatical. Wright suggests using the summary part of your LinkedIn profile to explain these gaps. Remain candid and accountable. Go beyond filling in gaps, Williams says. List positions and experiences that don’t necessarily align with your current career track. You never know what might strike a chord with a recruiter or an employer you haven’t considered. “They are going to discern what’s relevant to them, not you,” Williams says. Your employer may have studied law in another life, so your stint as an associate attorney might strike a chord. Don’t leave it out. Furthermore, include the various titles you’ve achieved at one company, along with the period of time you held them and your responsibilities for each. “This tells us how quickly you moved up within the organization and about your value add to the company,” Wright says. 3. Get to know the people behind the position. 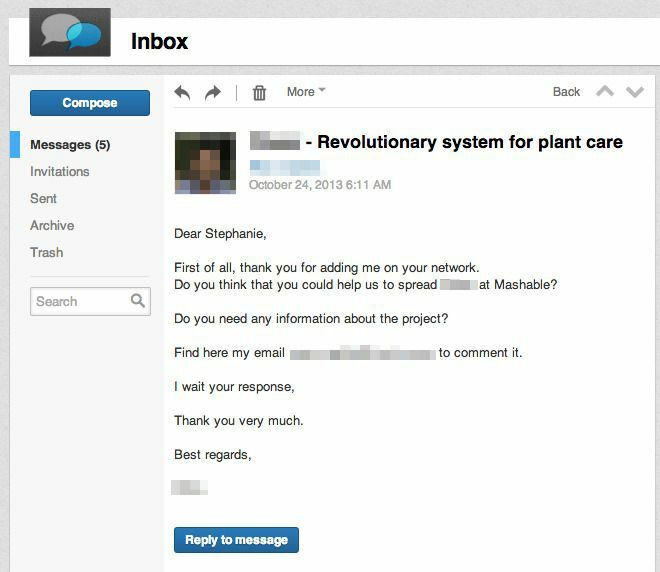 Here’s where LinkedIn creepiness works in your favor. Use your advanced search skills to find the hiring manager behind the position you’re applying for. Try connecting with that person. Even if she doesn’t accept your request, at the very least she’ll see you tried, or viewed her profile. Do your due diligence to get to know the people behind the company, Williams says. What do you have in common? Did your hiring manager volunteer at the SPCA in college, like you? What did he do before IBM? What articles is he sharing? 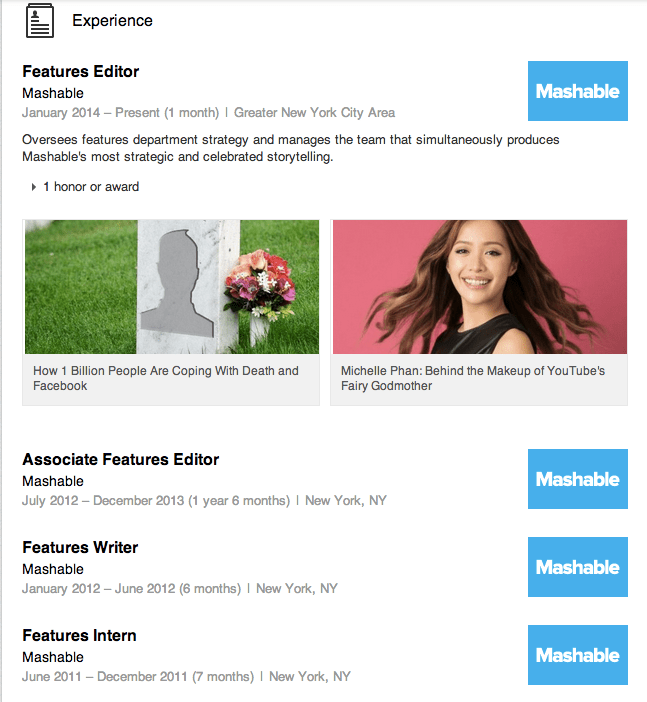 “For job seekers online, it’s not so different from meeting in person. You want to build a rapport first before asking for an opportunity,” Williams says. After you’ve established a connection or sent her an InMail, inquire about job opportunities, or ask someone to make an introduction so you can learn more about the company. People are much more responsive when they know you’ve taken the time to care. According to LinkedIn, 60% of professionals aren’t actively seeking new employment, but would be open to the opportunity if it presented itself. That stat makes LinkedIn a gold mine for recruiters. “Recruiters are looking for passive talent,” Williams says. Similar to our advice for job seekers, keep your profile open and public. LinkedIn Premium members will be able to see when recruiters are viewing their profiles, then can click through and see what kind of talent acquisition agencies are targeting them. Furthermore, use tools like InMail to reach out to especially promising candidates. (We promise most users won’t mind at all.) LinkedIn recruiter tiers start at $99.95 per month, up to $719.95 per month, with access to a variety of features, including InMail, premium search filters and out-of-network visibility. Whether you’re using LinkedIn’s free or premium models, the network’s tools can be highly valuable. 1. Don’t make us work. LinkedIn is a place for professionals. That level of professionalism should apply to all methods of communication across the platform. If you’re in PR, first reaching out to someone with an idea or a product, don’t come off too chummy or informal. Get to the point, graciously. One of the first rules of PR pitches is to share a deliverable early on. Whether in the form of an enticing stat, a kickass testimonial or a shocking video, you’ll need a hook to keep your reader’s attention. In the example above, not only does the PR representative never describe what he’s pitching; he doesn’t even link to it. Do you really expect people to type a company name into Google and then browse the site to learn more about it? People are on LinkedIn to get business done. It’s not Facebook — they’re not casually browsing photo albums out of boredom. Get to the point so we can all get back to work. We’ve officially exited the era of mass press releases. “The blind copy PR outreach just doesn’t work anymore,” Williams says. The advantage of social media is that you have access to personal details about people — a phenomenon that didn’t exist 10 years ago. 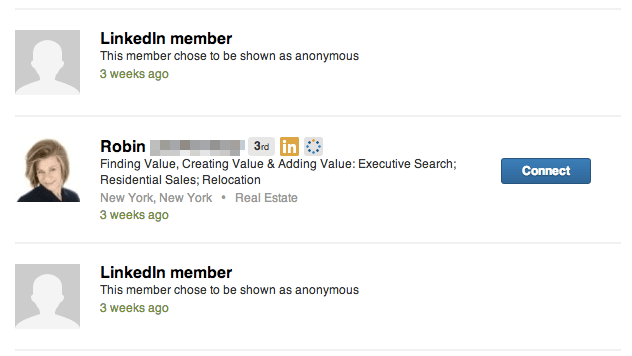 And it doesn’t take long to peruse someone’s LinkedIn profile for interests you might be able to tap. For example, by looking at my profile, you would see I posted a clip about YouTube makeup guru Michelle Phan. Perhaps you would use that information to segue into a pitch about a new iPad app for young women in STEM careers. That way, you’re demonstrating I don’t just cover “technology”; my speciality is digital lifestyle and social media psychology. Do You Know WHY Companies Provide Sponsorships? A little insight from our favorite American Author, Entrepreneur, Marketer & Public Speaker, Seth Godin.. The answer to the question, “how are you going to pay for this project?” is turning out to be sponsorship more and more often. If you don’t know why organizations want to sponsor things, though, it’s likely a long, hard road to find the sponsorship you seek. As the number of media options continue to explode (blogs, books, conferences, tattoos, speaking engagements, film festivals, stadiums, entire websites…) it’s worth thinking a little bit about why organizations buy sponsorships. 1. It might be a substitute for advertising. How many people see it? How much does it cost per person? (this is the cpm, but instead of cost per thousand page views or magazine readers, it’s cost per thousand impressions, which come in a myriad of ways). I think this is the film festival/book fair model. It’s a reasonable way to reach a hard to reach, high value group. 2. It might be a bragging rights thing. This means that the sponsor isn’t focused on tonnage, but instead wants the affiliation that they can mention to others. Sort of a reverse endorsement. The thing being sponsored isn’t a media outlet, then, but a license by affiliation. An example of this might be sponsoring a speaker coming to town. Clearly, the 500 people in the audience don’t constitute a useful CPM, but the fact that you did it gains you authority with those that notice what you did. 3. It might be a chance to influence the organization being sponsored. This would explain why big corporations are willing to sponsor political conventions. 4. It might be a useful way to inspire and focus your internal organization. When the people who work for you see you sponsoring a worthy charity or a thoughtful opinion leader, it changes how they do their job or how they focus their efforts. 5. It makes the CEO happy and earns the organization a seat at certain sorts of tables. I think this is the model for sponsoring a sports stadium, an act that has never been shown to have any value at all as a mass media choice. Because there are so many ways to come at this, valuing a sponsorship is difficult indeed. If you’re a bank sponsoring a bike sharing service, how do you compare that to five-hundred full page newspaper ads (about the same price over a certain period of time). Of course, you don’t. You can’t. Instead, you must be really clear internally about what it’s for. In general, if you’re clear about which of these five things you’re shooting for, most sponsorships are a screaming bargain compared to traditional media buys, particularly if you’re trying to reach an elite or elusive demographic. 4. Personalize and individualize coupons: This approach can be a bit more difficult to implement, but it’s one of the most effective. The idea here is to deliver the right coupon to the right person at the right time, meaning that you should add an element of personalization to the coupon experience. For example, offering a coupon on a bottle of face wash wouldn’t make sense three days after purchase, but would be well-received four to six weeks later when the customer is almost out of the product. Similarly, you can offer coupons on related products, such as a percentage off a facial moisturizing cream. Or, if you’re looking for a much simpler approach, working to personalize your emails is a good start — even something as basic as including a customer’s first name in the message can make a difference. Did You Know… Printed Paper Serves Economic & Social Benefits? Last week we shared interesting facts about how paper and printed goods aren’t as harmful to the environment as we thought and how they often provide more help than harm. We want to follow up with those observations by sharing the economic and social benefits of printed paper as well. Printed paper also serves many economic and social benefits. Millions of U.S. jobs – from tree farming to advertising – depend on print. Printing and related jobs are projected to decline by 16 percent and newspaper publishing by 23.2 percent by 2018. That’s a lot of people out of work, and, in the case of places where paper is manufactured, sometimes represents entire communities that are economically devastated. Print helps businesses stay profitable. Research has shown that direct mail is still the most effective way of targeting the right customers with the right message – especially for small businesses. Print helps small business owners get and keep customers. And digital advertising works better when it is mixed with print. New techniques in printing, such as print on demand (POD) and digital printing mean that fewer pieces of print can have a greater economic effect while decreasing impact on the environment. And when consumers are through with direct mail pieces, catalogs or magazine, they can be recycled, recovered and reused. Print serves those who don’t have constant access to computers. It may seem that everyone, everywhere has access to digital communications, and can afford the energy costs required to power them, but there are still millions of people in the world who depend on books and newspapers to learn and stay connected. For example, only 84 percent of U.S. households own computers. A recent survey by the Pew Internet & American Life Project suggests that a majority of American adults — 61 percent — report feeling overwhelmed by modern technology and some actively resist the push toward the hyperactive, hyper-connected mobile lifestyles that today’s devices enable. Print can be a more relaxing way to get your information. Getting information from print can serve as a welcome relief from technology. Think of it as a more natural way – easier on the eyes and easier on the environment. Did You Know… Paper Printing is Environmentally Beneficial? 65.1 percent of all paper in the U.S. is currently recycled. Did You Know… Most Employees Under 35 are Unhappy? We love our PIP team and are always excited to bring in new talents. But pressing deadlines among other pressing situations can cause any business to neglect creativity and contribution in an effort to just get the job done. Employers become comfortable with letting certain people make certain decisions or contributions to a project that may have deserved reviewing from a different perspective. More employees than you would think would be happy to share input or lend a hand in projects they wouldn’t normally get a chance to touch. But because that’s not their ‘job’, they don’t even get to glance at it. Survey after survey tells us that employees under 35 are largely unhappy. Not because we don’t pay them enough (although starting salaries are still an issue), but because they want to contribute and we’re not letting them. We have to realize that millennials have been creating content for most of their lives. Be it videos, photos, song lyrics or drawings, they are used to sharing and receiving immediate feedback. Agency structures don’t encourage or celebrate that kind of contribution from the start. We must change that. Hiring the best and brightest isn’t enough if we relegate them to spreadsheets and menial labor. Yes, we all had to pay our dues. The difference is that they have other options. Options that allow their sharing mentality to flourish. Options with a more glamorous reputation. Options that seem to remunerate at higher levels. We have been working with young people through our Rising Stars program. We talk to them. We listen to them. They surprise us. They inspire us. They light a fire under us. Their enthusiasm is contagious, and their naivete is only glaring when they challenge the status quo. Every once in a while we have to remind them that “anything is possible, everything is not.” Wouldn’t you rather pull someone back than constantly ask why they don’t speak up? If you ask why they have been so giving of their time to industry efforts, they will tell you it’s because they care. It’s because they feel like they can make a difference. Harness that or lose them. Agency search and selection has always been integral to our growth. But the process is time consuming for marketers and costly for agencies. Most marketing leaders are frustrated by the mating (dating) ritual. So how can we improve it? Stop ambulance chasing. An agency leader once said to me, “We have to be careful what we eat,” meaning we should be more selective about accounts we pursue. Desperate agencies will do desperate things. Best-in-class agencies are disciplined and rigorously screen opportunities. Those that have the most consistent record of new-business success have management buy-in to develop and adhere to screening guidelines. Agencies can dramatically increase new-business by learning to be more selective with new-client opportunities. The 4A’s Opportunity Screening Criteria guidance advises that just as clients screen agencies to find the best fit, so should agencies screen clients. Marketers must also do their homework. Before embarking on an agency review they should step a d begin by assessing their own marketing organization. Once internal enhancements are in-place, then — if new or expanded agency resources are a priority — they can invest the time and apply the discipline needed to conduct a rigorous search and selection process. We continually hear about RFPs from hell and marketers trolling for ideas. It’s time to stop counterproductive tactics. The ANA and 4A’s have partnered to develop prudent Guidelines for Agency Search and fundamental Agency Selection Briefing Guidance tools. Let’s use them and save ourselves a lot of blood, sweat and tears. Some compensation arrangements purport to drive efficiency into the client-agency relationship. The problem is that all the procurement benchmarks are largely based on old information. “Working” and “non-working” ratios based on old-media models are no longer relevant in social media and other sharing platforms. Master service agreements that have agencies indemnifying clients against patent assertions are turning us into insurance companies. And extended payment terms that ask agencies to wait 75, 90 or (ridiculously) 120 days put us in the position of acting like a bank. We have to work harder to show value to clients. Agencies must generate ideas in new ways. Sometimes that’s an ad, sometimes a platform and ever more frequently, a new way to look at what a client sells and how they sell it. We used to do this as a course of business, but we’ve gotten away from it and we need to return to this practice. We must constantly prove our worth in ways that go above and beyond delivery of scope and drive for results that make a difference in a brand’s destiny. Standing up for what we believe in will go a lot farther than caving. The letters “N” and “o” form a word, and we need to know when to use them together. What an awesome insight to start off the New Year?! We want to try harder to involve each other among our PIP Triad Team this year to provide our customers with the best quality product and service. We hope you and your team will do the same! Happy 2014! !